Unvented water heating is the fastest growing sector of the UK market, led by Heatrae Sadia’s Megaflo. The Megaflo name has become synonymous with unvented cylinders and is often used to refer to unvented cylinders in general! Today, most new homes have unvented hot water systems installed as standard as they provide a highly efficient means of storing and distributing hot water throughout the property. Whilst the Megaflo is priced at the upper end of the UK market, similar products are available from most major manufacturers, such as Telford, Ariston, Worcester, Vaillant, RM Cylinders, Main. Generally, these cylinders will all deliver similar performance, although there are some that we would certainly stay clear of! Most are made from high quality duplex stainless steel and typically come with a 25+ year warranty (on the cylinder, but NOT the components). Essentially, unvented systems are available for all budgets and to suit individual and specific requirements. The heat source is typically provided by a gas boiler, electric immersion heater or some renewable heat source, such as solar thermal or heat pumps. Unvented systems require several safety devices to protect against the increased pressures and hot water expansion. These safety devices MUST be correctly installed, otherwise the system may be unsafe and could be extremely dangerous to use. The installation of an unvented hot water system must be installed by a G3 qualified engineer, with an unvented hot water certificate. Traditional British domestic hot water systems consist of a hot water cylinder fed from a storage cistern that is vented to the atmosphere. The flow rate and water pressure is dictated by the vertical distance of the storage cistern above the outlets. A typically house or bungalow with a storage cistern in the loft, may have a vertical distance of 1 meter from the storage cistern to the shower head. This equates to a head pressure of 0.1 bar, which is poor and unfortunately all too common! Most unvented systems are limited to around 3 bar pressure, which is 30 times the pressure of a typical shower! Unvented or high pressure hot water cylinders are powered by mains pressure water, rather than the head of pressure created by a water cistern in the loft. This means that in most cases you will benefit from stronger hot and cold water from your bathroom taps and showers, as well as no longer needing a large water tank in the loft. Typically in the UK, the kitchen cold tap will be supplied directly from the mains and therefore usually has good water pressure. With an unvented hot water cylinder, you will achieve similar pressures from all taps – both hot and cold. 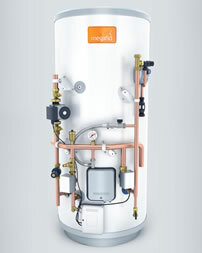 Hot water is stored at mains pressure, and the cold water mains is connected directly to the unvented cylinder. When a hot tap is opened, hot water is forced through by the incoming cold water which replaces the hot water. There are no cold water storage cisterns, vent pipes or expansion tanks, but instead, cold water is supplied directly, at mains pressure into the cylinder, thereby providing mains pressure water throughout the entire property at mains pressure. A pressure vessel or air bubble allows the water to expand as it is heated. Without getting too technical, an unvented cylinder relies on the incoming mains pressure water and flow rates. There are no moving parts and if correctly installed, provides a reliable and efficient hot water system. There are a number of safety devices which are essential to ensure safe operation. For many people, this is the important part! The primary consideration is does your property have suitable incoming water pressure and flow rates. This varies from one area to another, and it is absolutely essential that this is checked. Most manufacturers recommend a minimum of 1.5 bar pressure and 20 l/m flow rate, but there other factors to take into consideration. If your incoming water supply does not meet the minimum requirements, then an Accumulator or Pump Set may be considered. Hot and cold water supply to all outlets at high pressure. Balanced hot and cold water supply pressures throughout the system – wider choice of taps and mixers. High performance showers without the need for pumps. No storage cistern in the loft. Allows greater system design flexibility. Cylinder can be sited almost anywhere within the property. Normally there would be no back-up of stored water should the main water be shut down for any reason. If the mains water pressure is low then all water outlets are affected. The possible need for long runs of safe discharge pipe with high temperature capacity. The need for higher level of maintenance compared with conventional systems. Apex Plumbing and Heating are registered and qualified to install and commission unvented hot water systems in accordance with Building regulations G3. Please contact us for further details or to arrange a no obligation written quotation.